A couple of months ago on another blog we wrote about the nation’s 17th favourite piece of art, Stik’s couple on Princelet Street. Never static, there have been some developments, evolutions and surprises. The first bit of news is that unsurprisingly (as Stik had told us when we interviewed him) the couple was restored to its pristine original condition when Stik painted over the elephant a couple of weeks ago. Study that photo taken 2 weeks ago closely, on the right there is one small pottery face where several months ago there were two. The niqab wearing female next to Stik’s couple got lucky last Friday night and now has found a new partner! The cautious and often well advised anonymity of street artists sometimes leads to prolonged searches for an artist’s identity and not always one that ends in success, as indeed was the case for me regarding the identity of the face maker. Last week when hunting for the source of a sticker we stumbled across the identity of the artist who makes the small faces, j.ace. Well done j.ace, we love your faces but putting up signed artworks three days after we found your identity – that’s very mischievous humour! This entry was posted in News and tagged casting, figurative, figure, j.ace, Jace, London, portrait, Sculpture, Shoreditch, small faces, Stik, Street Art, Tour on 10/15/2017 by Shoreditch Street Art Tours. Street art should never go over our heads though great examples of street art are often literally looking down on us. Street art environmentalist and master craftsman Jonesy has been adding a few wonderful bronze castings on top of lampposts around Shoreditch. The first one I spotted by complete chance a couple of weeks ago caused me to spend some time wander about with my eyes cast upwards looking for more, which revealed other artists working over our heads! This entry was posted in News and tagged bronze, casting, insect, Issac Cordal, Jonesy, Sculpture, Shoreditch, Sticker, Street Art, street artist on 10/10/2015 by Shoreditch Street Art Tours. 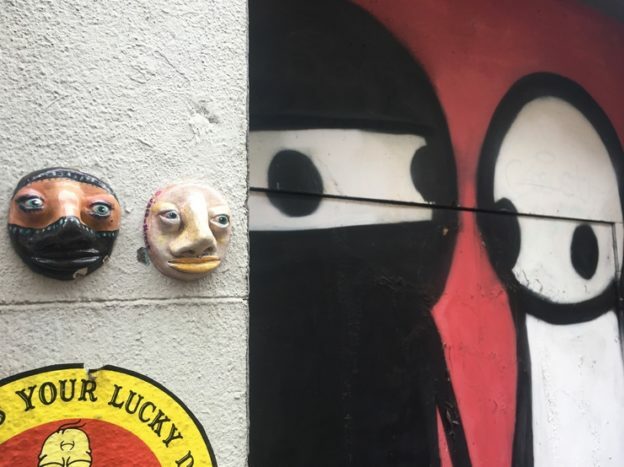 Shoreditch Street Art Tours is passionate about revealing to our guests to the best work of street artists and graffiti writers, from stylish tags to superbly detailed figurative painting, via humourus stencils and intricate sculptures. We know our work is bearing fruit when guests make comments such as “I can’t stop looking at walls hoping to find little bits of street art” and “Every time I look at a lamppost I expect to see stickers”. When our guests find items of street art that even we haven’t seen before then we know they truly have got their “eye” in. On today’s tour, after seeing a “Be My Valentine” piggy and a “Star” piggy one of our guests very excited pointed through a gate into a property – there was the most fantastic parachute piggy. Well done Liz! A search through Love Piepenbrinck’s Flickr collection and Facebook photos and her favourites doesn’t turn up any evidence of photographs so far so we wait with baited breath to find out what Love Piepenbrinck calls it. “Special Forces Piggy”? This entry was posted in Artist, News and tagged Artist, casting, German, installation, London, LovePiepenbrinck, piggy, Sculpture, Shoreditch, Street Art, street artist on 02/23/2014 by Shoreditch Street Art Tours.